Antibodies that are ideal Neuron/Synapse, Astrocytes, Glia, Microglia, Olidogodendrocytes, and Progenitors and Schwann Cell Markers. Image: GFAP (Catalog#: CH22102) Staining of of Astrocytes in the Ventral horn and Funiculus of Adult Rat Spinal Cord (Dilution 1:500). Courtesy of Dr. Qi-lin L. Cao, University of Louisville School of Medicine. Rat spinal cord homogenate showing the major intermediate filament proteins of the nervous system (lane 1). The remaining lanes show blots of this material stained with various antibodies including: NF-H (CH22104), NF-M (CH22106), NF-L (CH22105), NF66 (CH22101) and GFAP (CH22102). Glia (and the largest set of Glia named Astrocytes) are crucial in the development of the nervous system and in processes such as synaptic plasticity and synaptogenesis. These cells have a role in the regulation of repair of neurons after injury. 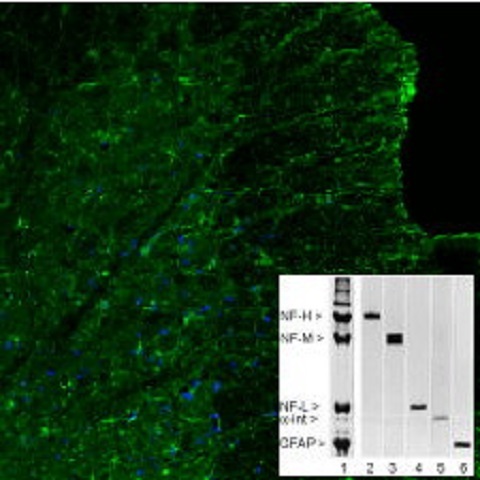 In the CNS, glia suppresses repair. Glial cells known as astrocytes enlarge and proliferate to form a scar and produce inhibitory molecules that inhibit regrowth of a damaged or severed axon. A subset called Microglia are are like specialized macrophages capable of phagocytosis that protect neurons of the central nervous system. They are derived from hematopoietic precursors rather than ectodermal tissue; they are commonly categorized as such because of their supportive role to neurons. Neural Progenitor Markers that are capable of tracking cells as they undergo expansion and differentation from rosettes to neurons. Applications include immunostaining, immunoprecipitation, western blotting and FACs. Antibodies that are ideal to labeling neurons and synapses. Diseases that result in injury to the oligodendroglial cells include demyelinating diseases such as multiple sclerosis and leukodystrophies. Cerebral palsy (periventricular leukomalacia) is caused by damage to developing oligodendrocytes in the brain areas around the cerebral ventricles. Spinal cord injury also causes damage to oligodendrocytes. In cerebral palsy, spinal cord injury, stroke and possibly multiple sclerosis, oligodendrocytes are thought to be damaged by excessive release of the neurotransmitters. Oligodendrocyte dysfunction may also be implicated in the pathophysiology of schizophrenia and bipolar disorder. Markers for neurons and glia of the peripheral nervous system (PNS). Schwann cells provide myelination to axons in the peripheral nervous system (PNS). They also have phagocytotic activity and clear cellular debris that allows for regrowth of PNS neurons.